Lincolnshire motorcycle accessory manufacturer, Drury Precision Engineering, is world-famous for its high quality Evotech Performance (www.evotech-performance.com) range of motorcycle accessories such as replacement tail tidies, crash protection products, engine guards and guards for radiators and oil coolers. Intended mainly for road bikes but, in some instances also fitted to their racing counterparts, the products are machined mainly from aluminium, often with the addition of punched and folded sheet metal parts, which is a particular specialism of the Alford company. Sales of the accessories have increased dramatically in recent years, which was putting pressure on production. So at the end of last year, Dan Rack, Chris Vines and Nick Cooper, who jointly run the company, set about addressing a shortfall in milling capacity, which was the main bottleneck. With three 40-taper vertical machining centres on the shop floor, they were considering purchasing a 1 fourth. 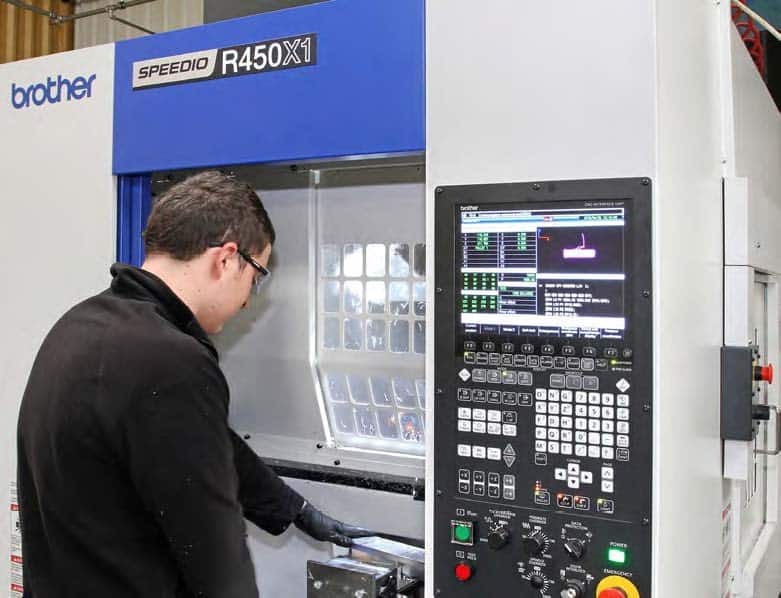 Instead, they decided to part – exchange one of them to purchase a single, 30-taper Brother Speedio R450X1 machining centre from Whitehouse Machine Tools (www.wmtcnc.com). The high-speed, turret-type machine with twin automatic pallet changer (2APC), installed in mid-January 2015, is so fast that it nearly equals the output of the two conventional VMCs that remain, at the same time saving space and reducing labour costs. Mr Rack said, “A typical crash protector bracket, for example, used to take 40 minutes to mill on a 40-taper VMC, whereas the job is completed in just over 20 minutes on the Brother machine. 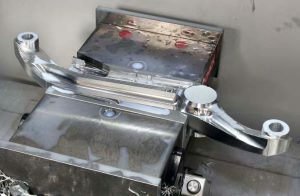 “With the 22-station turret type tool magazine, which is the option we chose, we measured chip-to-chip time at less than two seconds, compared with 18 seconds on the other machines. 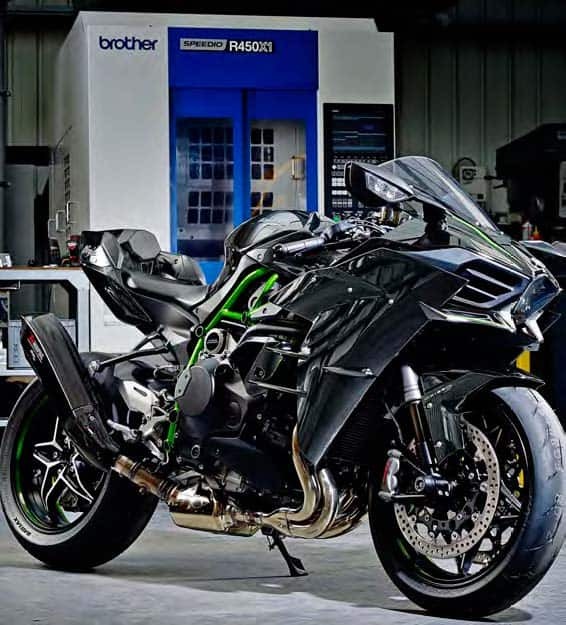 To exploit fully the benefits of the Brother machine, with its minimal idle times, 16,000 rpm spindle and 200-block look-ahead in the Brother CNC-C00 control, Mr Cooper, who manages the machining department, concentrates on 3D profiling of complex component shapes derived from scans taken of the motorcycles for which the accessories are intended. That way, the operator can fixture the job and walk away for a reasonable amount of time to do something else. Being able to utilise spare time in this way is helpful in maximising the efficiency of the 22 staff at the company, which is a priority for the management at Alford. Mr Rack also pointed out that the high speed tool change on the R450X1 gives Drury Precision’s designers more flexibility in SolidWorks, as introducing a couple of extra tools into a cycle to add cosmetic features such as a radius does not incur much time penalty. To do this on a 40-taper VMC would unacceptably reduce productivity. Very fine surface finishes can be obtained when profiling on the Brother, although tool paths created in EdgeCam are often deliberately programmed so that marks made by the milling cutters are visible on finished products. Motorcycle enthusiasts prefer the look, as they know that parts have been machined from solid, rather than cast. When Dan Rack and Chris Vines were considering options for migrating from the 40-taper VMC platform to 30-taper with 2APC, the decision was taken to opt for the Brother machine due in part to a successful demonstration at the Kenilworth technical centre and showroom of Whitehouse Machine Tools. Another positive factor was the integral 2APC on the R450X1, which contrasted with retrofit automation equipment on the other shortlisted machine. Various optional extras were specified to improve productivity, such as through-spindle coolant, air blast cleaning of the tool taper and mist extraction. The Evotech Performance side of Drury Precision’s activities started in 2003, when Chris Vines was unable to find a compact, aluminium tail tidy to replace the original plastic version on his Honda 954 Fireblade. So he decided to make one himself. In 12 years, motorcycle accessory manufacture has grown to become larger than the original subcontract machining activities at Alford. Nevertheless, this part of the business still accounts for a large percentage of turnover and is almost exclusively focused on sheet metal working using a Trumpf punch press, two 7-axis CNC press brakes and a Fladder deburring machine from Denmark. Typical items manufactured are parts for motorhomes, enclosures for pressure washers, and hospital trolleys. A sizeable amount subcontract work is also carried out for world and national level motorcycle race teams.